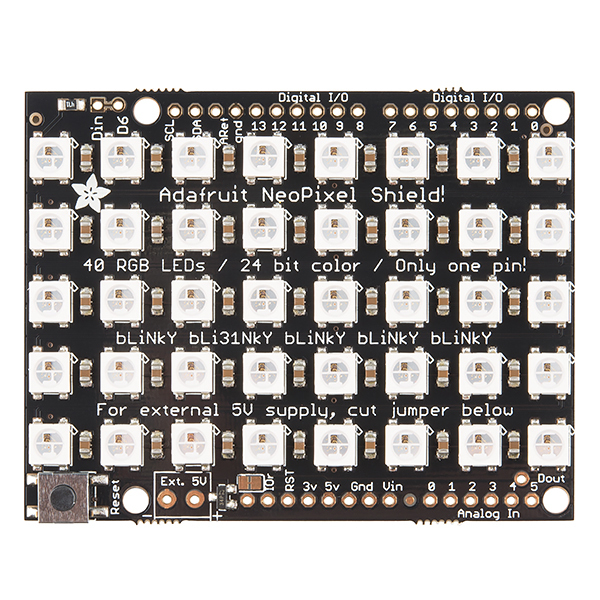 This is the NeoPixel Shield from Adafruit. 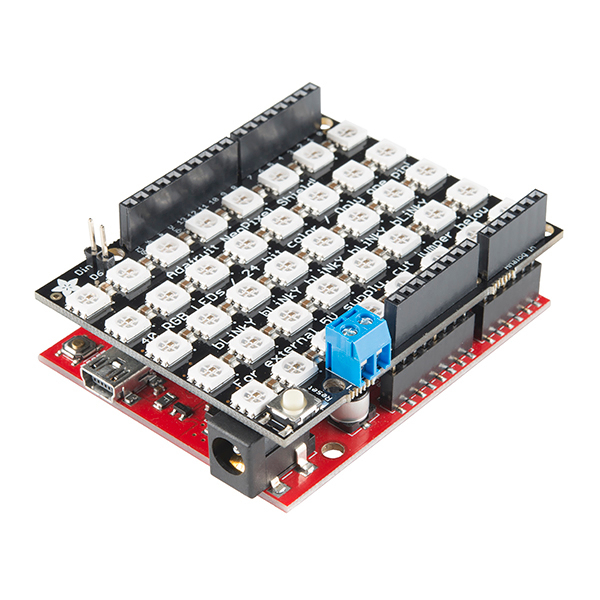 This Arduino shield is equipped with 40 WS2812 RGB LEDs arranged in an 5x8 matrix with on one pin (Digital #6) needed to control them all. Each shield is powered by the 5V onboard Arduino supply and as long as you aren't lighting up all the LEDs full power white that should be fine. You can also solder in the included terminal block to attach an external 4-6VDC power supply in case you need more power than what the Arduino provides. 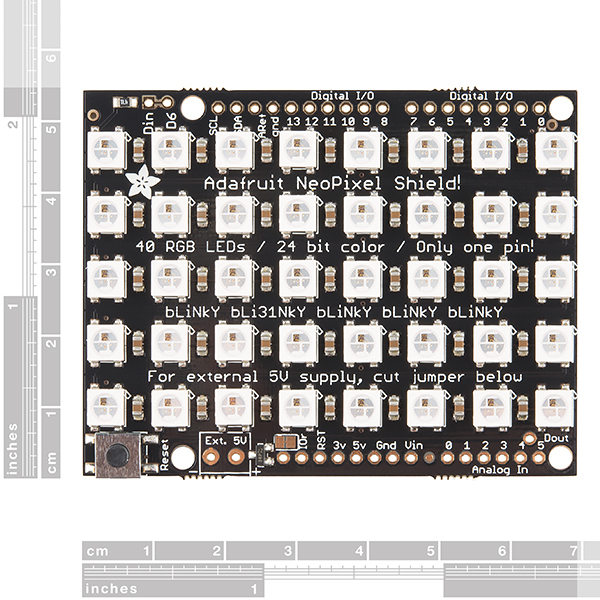 Additionally, you can chain as many of these panels together as you'd like when tiled separetely from the Arduino. For the second panel, connect the DIN connection to the first panel's DOUT, connect the ground pins together and power with 5V. It should be noted that after five or more panels you may run low on RAM if you're using an Arduino Uno. This product is great. The LEDs are quite vibrant. I have mine doing a random color dance - it's like a fireworks show. With all LEDs on full brightness and white, the load approaches 2.5A, so you can't do that without external power. But if you hook up the extra power and do it, be sure to bring sunglasses, because these LEDs are crazy bright. I never run them on full brightness. Good on you SparkFun for carrying these. Small, innovative DIY electronics companies are the best! Really, you guys rock. I received the product announcement and had to read it several times, shake my head, and check to see if I took my Medication. This is great that the two are working together. 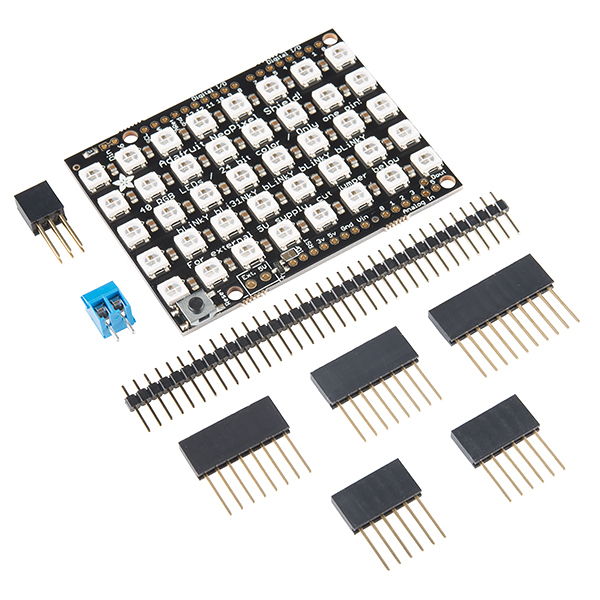 Adafruit and SparkFun = a lot of potential for the community. Remember the lesson you learned from Raiders of the Lost Ark: Don't stare at the glowey thing - this shield is face meltingly bright. Beware my tale of woe. I bought one of these for a game I was thinking about designing. I decided to use the breakaway headers because it is a cleaner look than the stackable headers. It wasn't until after I had nicely soldered in all 32 pins and had it connected to my Arduino that I started to wonder how I was going to connect my other devices to the Arduino pins. On the plus side, it gave me an excuse to purchase another of these -- I didn't feel up to solder-sucking that many header pins. On this second board, I used the stackable headers and now have my buttons and switches working, in addition to the NeoPixel Shield array. FINALLY! 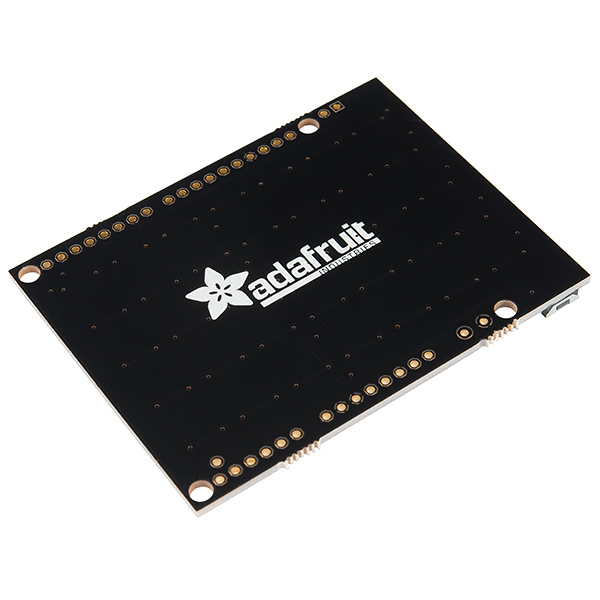 SparkFruit-AdaFun IS BECOMING A REALITY!!!!!! Well its great to see that two companies in the same field that are innovating & developing are getting along so well that things like this are possible. It really shows how great you two are. I'm looking forward to Nate on Ask an Engineer Saturday (Jan 11, 2014). we tried to merge with makerbot on 4/1 (MakerFruit AdaBot Industries) - but it was called off due to investor relations. Wait... Phil is that true? That would have been very interesting if it happened. i asked bre the ceo of makerbot if we could make the announcement on 4/1 (it happen to be april fools day) but he said no, raising a round at the time and would freak out people... and that is why we were not able to say for at least one day we were MakerFruit AdaBot Industries.